QUESTION: Sir; I have noticed that the Roman and Greek hoards of coins you have offered are silver. You do not offer hoards of bronze coins. I have two questions. First, are broze hoards less common? Second, why have you been a buyer of large hoards to begin with? 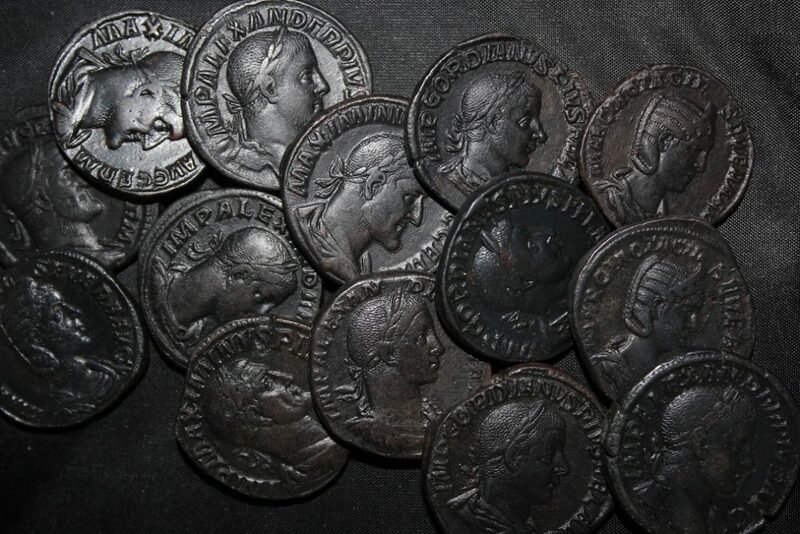 ANSWER: There are hoards of bronze coins from the 3rd century that are found. However, bronze corrodes easily. Therefore, the hoards that do exist are far too often not really salable because the condition is typically quit poor. I do have one small hoard of sestertius from the early 3rd century (pictured above) that begins with Maximinus I (235-238AD) who really begins the major decline of the Roman Monetary System. 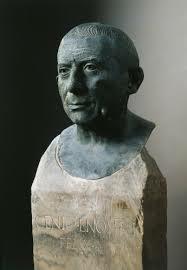 It was Maximinus who targeted the rich and simply declared that everything they owned belonged to the Empire, a very early version of Marxism. I will make this available, but there are only about 100 bronze sestertius that was the main unit of account. The condition is excellent for bronze since there are not corroded. I also have a later 3rd century hoard of antoninianius which were once silver and had been debased to bronze silver plated. This was a hoard I purchased back in the late 1980s with over 10,000 coins. However, the salable coins were probably less than 3,000. 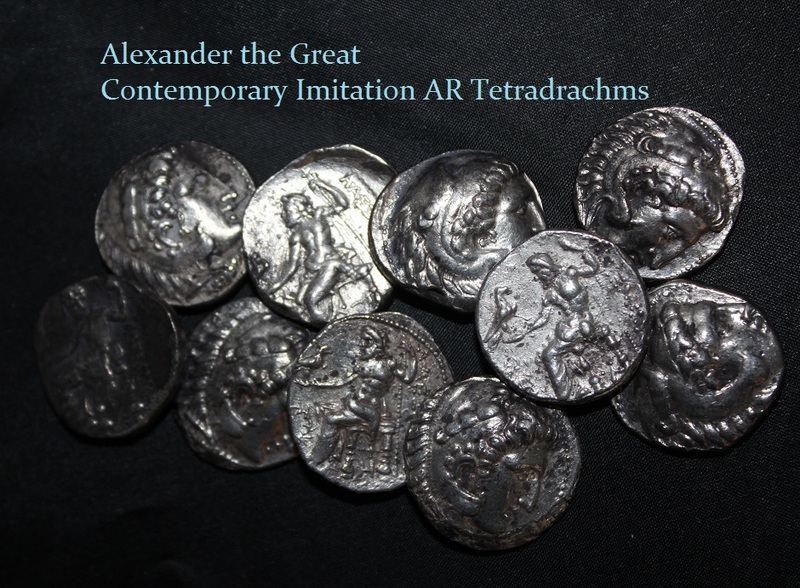 I have the other part of the Alexander the Great silver hoard. This was mostly drachms, but there are some tetradrachms as well perhaps about 100. Now, as to why I have purchased hoards over the decades is simply that they provide a snapshot of the economy at that point in time. This demonstrates what was in circulation and a hoard can be dated by the last coin included and this has correlated with periods of economic stress. Now, in the case of this Alexander hoard, intermixed you find contemporary imitations that are struck on the outskirts of the empire. Here are contemporary imitations that were inside the hoard. They are generally of the proper weight, but you will notice that there is some small parts that are corroded. This reflects that the silver was not properly refined. Here is a jug I purchased also back in the early 1990s. It contained the small reduced bronze coins toward the collapse of the Roman Empire. Despite the fact that they were inside a jug, you will notice that they we covered in corrotion to varying degrees. Therefore, the find was more valuable as a snapshot of the economy rather than as a hoard of salable coins. 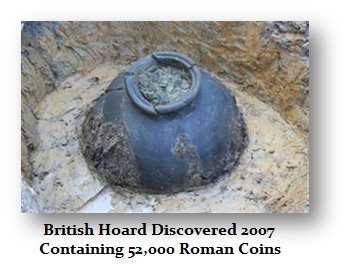 In 2007, there was a huge hoard disovered in England with over 50,000 coins. Again, they were bronze and it was a mixed find where some of the coins in the center were salable and others were interesting snapshots, but corroded. These type of hoards from the 3rd century exist because of the stressful period both politically as well as economically. This is also when the barbarian invasions were beginning and as I have stated before, it was Aurelian who constructed the wall around Rome to protect it from the barbarians in 270AD, which was not needed previously. Large hoards are typically found burried in pottery. In a southern Spanish park, construction workers dicovered a 1,300-pound hoard of Roman coins. A Viking hoard, the second such large hoard discovered in Sweden, has been unearthed revealing that the majority of the coins are from the Arab world. Hoards of this nature demonstrate how the trade routes fundctioned. Hoards are discovered in Asia and the Middle East. 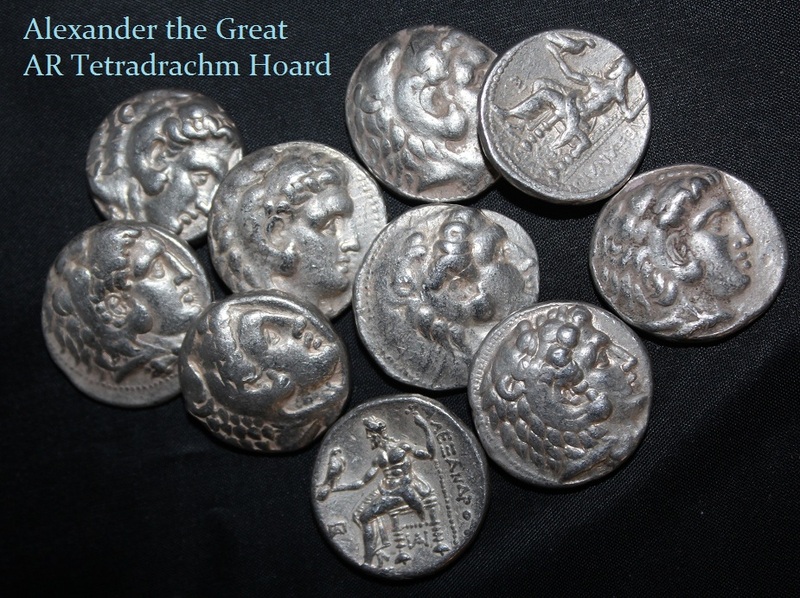 A hoard was disovered in Israel with Greek tetradrachms from the 2nd century BC. Roman coins have even been discovered in Japan. This has opened a lot of questions as to how did 4th century Roman coins end up in Japan. Not all hoards have been because of economic stress. One of the most famous hoards was stashed away because of a volanic eruption. The Boscoreale Treasure/Hoard is the name for a large collection of Roman gold coins along with exquisite silver and gold Roman objects discovered in the ruins of an ancient villa at Boscoreale, near Pompeii, southern Italy. Consisting of about the 1,350 gold aurei, which included 637 gold coins of Nero alone. This one hoard was worth 135,000 sesterces, which was more than half the tolal value of coins discovered in Pompeii itself. There were also over 100 pieces of silverware, as well as gold jewellery. The disovery of objects is now mostly kept at the Louvre Museum in Paris, although parts of the treasure can also be found at the British Museum. The coins were sold over time to collectors. The precious metal objects from the Boscoreale Treasure were illegally exported from Italy and were purchased on the black market by Baron Edmond de Rothschild (1845-1934), who donated it to the Louvre Museum in 1896. It appears that the objects were deliberally hidden in the storehouse prior to the eruption of Mt. Vesuvius. The name written on many of the containers was Maxima. A woman was found dead in the ruins, but we do not know if she was Maxima or a servant who stayed behind. 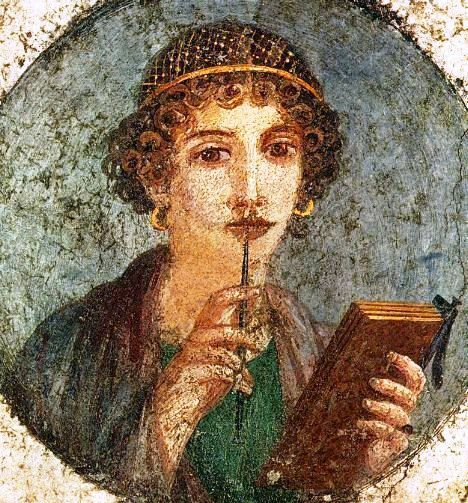 The villa appears to have been owned by Maxima’s father L. Caecilius Jucundus, who was a banker from Pompeii. This one hoard was a substantial cash reserve of the banker. That makes sense given the vast wealth in coins discovered. He also seems to have inherited the wealth of the Julio-Claudian dynasty in Campania. Jucundus had a villa in Pompeii as well and his banking records have survived. Boscoreale is well known to Roman numismatists as the find spot of a hoard of about 1,350 gold aurei, the latest of which dates to 78AD whereas the volcanic eruption from Mount Vesuvius on August 24, AD 79 burried the villa in ash. The villa remained undisturbed until 1876. The coin hoard lay undiscovered for almost another 30 years. Unfortunately, there was no formal study of the Boscoreale coins made before they were dispersed into the market. There was a list published back in 1909 which included material from other finds as well. Nonetheless, the three coins illustrated above all have a very distinctive feature that identifies them from Boscoreale. This is their deep-red toning. The Boscoreale Hoard was discovered in the water cistern of a villa, where the owner had hidden it fearing an impending catastrophe. Perhaps, the hoard was stashed when the eruption began. However, what killed the people was the deadly pyroclastic cloud which engulfed the region. It was the resulting intense heat of which imbued all the gold coins with the beautiful red toning that we now see almost 2000 years later. The coins were sold and there was often written tags noting their origin such as an aureus of Nero from the A. J. Fecht bequest to the American Numismatic Society from 1948 which had an original tag that noted: “ex Boscoreale find, Pompeii, 1898”. We should not underestimate the total currency stock or money supply held by non-aristocrats living in the Pompei. The fugitives who died in room 10 of the Villa in Oplontis carried with them over 18,000 sesterces worth in cash. Life in Pompeii did not stop instantaneously when Vesuvius erupted. Fugitives took valuables and money with them. The coins found with skeletons are a mix of savings, daily earnings, and pocket money. The coins found in the shops and houses reflect what fugitives left behind. Looting and salvaging after the eruption further complicate the picture. The average size of the hoards is six times the yearly subsistence for an adult at that point in time yet the number of persons depending on this money or the time span over which the hoards were formed is unknown. Therefore, the discovery of the hoards from pompei are more complicated than the hoards discovered elsewhere in times of economic and political uncertainty. 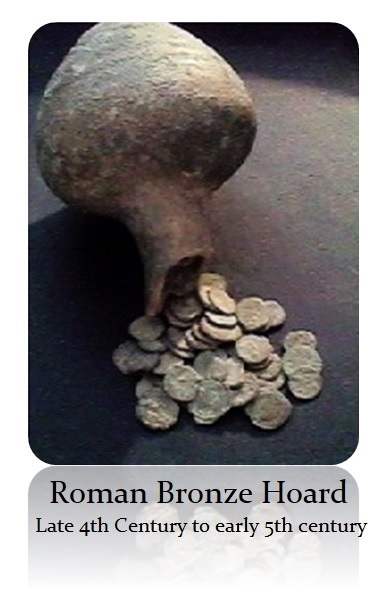 These type of hoards reflect generally one person which is different from the hoards of Pompeii itself as distinguished from the banker’s hoard or cash reserves reflected in the Boscoreale discovery. I will prepare some of the coins from hoards for clients to select. It just takes time to ensure which coins are of sufficient grade to offer in the first place. My purchase of hoards over the decades has been key to mapping the monetary system as well as the money supply and trade routes which provide guidance for trends still today.